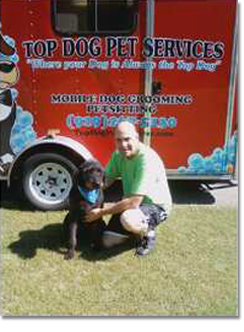 Thank you for taking the time to visit Top dog Pet Services, my name is Tony and I am an experienced dog groomer. Having graduated from New York School of Dog Grooming in Manhattan I am originally from New York and owned and operated a successful mobile dog grooming business for sixteen years before moving to North Carolina and opening Top Dog Pet Services a successful business since 2008 with many loyal clients who have become part of the Top Dog family, and i hope who is reading this will join our family as well. A few times a year I go to major pet grooming conferences to keep myself up to date with the newest advancements of styling techniques, grooming products and equipment to ensure your pets comfort and needs are met. I have a natural connection to all animals and I am Uncle Tony to all my clients pets, I consider myself like Dr. Doolittle (no I don’t think they talk back to me). In my spare time I volunteer my time and grooming skills at animal shelters and rescue groups in the area which I find very fulfilling. My hope is that with my years of unique and varied experiences I can provide you and your pets with the very best care.